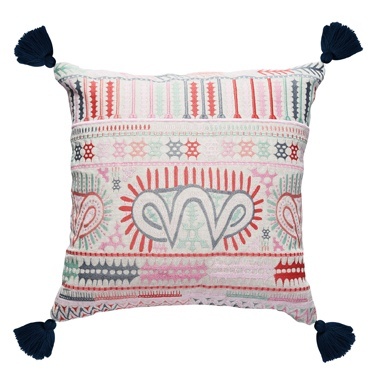 The Emporium Sofia Cushion features an embroidered design that is reminiscent of traditional Indian textiles. The cushion is then finished with tassels on each corner. The Emporium Collection is a celebration of colour and pattern. Each piece is embroidered or embellished to create a fun and detailed range. With tones of Aqua and Sky Blue through to Bright Pink, it is an easy solution to add colour to any room.